STOP THE MINING! STOP THE KILLINGS! JUSTICE FOR THE CAPION FAMILY OF THE TAMPAKAN MASSACRE! JUSTICE FOR THE CAPION FAMILY OF THE TAMPAKAN MASSACRE! The Committee for Human Rights in the Philippines in Portland, San Francisco, and New York and D.C. based Katarungan: Center for Peace, Justice and Human Rights in the Philippines condemn the October 18th slaying of Juvy Capion and her two sons by the 27th Infantry Battalion(IB) of the Armed Forces of the Philippines (AFP). This is part of a continuing pattern of intimidation and impunity used by the Philippine military to violently suppress the growing opposition to aggressive mining development in the ancestral lands of the indigenous peoples of Mindanao. The October 18th massacre in Cotabato, Mindanao, Philippines took place at around 6 o’clock in the morning, when soldiers of the 27th IB, according to human rights workers and church people in the region, strafed the side of the Capion household. This attack upon unarmed civilians caused the injury of four-year-old Becky and the murder of her mother, Juvy, who was two months pregnant at the time, along with her two sons, Jordan “Pop”, 13, and John “Jan-jan”, 8. Despite the military’s blatant lies to cover up the murder and insisting the firefight was initiated by Daguil Capion, there are no witnesses who support the 27th IB’s claims. Statements show that Daguil was nowhere near his home at the time of the attack, and it was staged by the 27th IB due to Daguil’s ongoing involvement in the campaign to fight against the Xstrata-SMI mining company. X-Strata SMI is the largest mining investor in the Philippines with US$5.9 billion investment in Tampakan, South Cotabato. The Tampakan site contains the largest underdeveloped copper and gold deposits in Southeast Asia. Its copper reserves are estimated to be between 13.9 to 15 million metric tons. The gold in Tampakan is said to amount between 16.2 to 17.9 million ounces. However, approximately 7,095 of the 10,000 hectares of the proposed mine site lie within the Blaan’s ancestral lands. The Tampakan project will displace an estimated 2,600 families, or 4,000 individuals, from the Blaan Tribe. The AFP was sent to use its full and terrifying force to silence the Capion family’s activism against the aggressive mining in their community,as well as to serve as an example for other locals who oppose destructive mining practices. 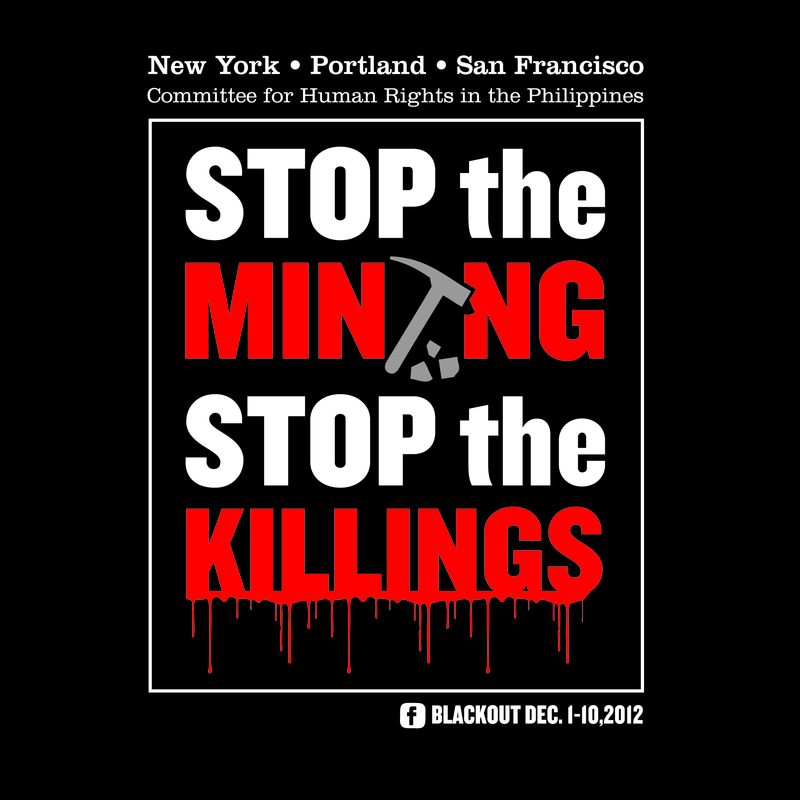 In the case of the Tampakan Massacre and deaths of the Capions, X-Strata SMI worked with the AFP to protect its investments for the “Tampakan Gold Project.” Scores of anti-mining leaders and activists have been harassed and subjected to violent abuses either by developers, the government, or a combination of both. Since 2010, 29 cases of human rights violations have been recorded in this area, and among them are anti-mining activists. Because no one is held accountable for these atrocities, including the killing of pregnant women and children, elements of the Philippine military continue to violate the rights of innocent civilians. Despite these well-known human rights violations, the U.S. continuously contributes $30 million in taxpayers dollars to military aid in the Philippines every year. With over 114 politically motivated killings, 12 enforced disappearances, 200 plus arrested and detained without warrant or trial, and 20,000 plus victims of harassment from the military and other government forces a culture of impunity has been imbued within the Aquino administration and the culture of the AFP and police. Instead of tackling the human rights crisis head on President Aquino and other key members of the military and police deny that a crisis even exists and tags human rights concerns as “leftist propaganda.” This type of talk merely reinforces the culture of impunity and gives an explicit green light to further military and police operations that contribute to the worsening human rights situation in the Philippines. Justice for the Capion family, and a full investigation on the assault leading to the deaths of Juvy, Jordan, and John. Ensure all those responsible for these deaths are held accountable, and are prosecuted to the full extent of the law. The AFP withdraw from all Lumad areas in order for the harassment and violence imposed on civilians in surrounding communities to end. Also, the full removal of military units in all areas of the Philippines afflicted by aggressive mining development and ore prospecting. Xstrata-SMI leave Blaan ancestral domains, abandon the Tampakan Project, and be banned from the Philippines. All U.S. military aid to the Philippines be cut, since it is funding the death of civilians including women and children.